Get your friends, work colleagues or family together to play in the first indoor trampoline social dodgeball competition on the Sunny Coast. 6 team competition with winning team with most competition points at the end of the competition wins $500. Looking for some fun and a athletic thing to do? 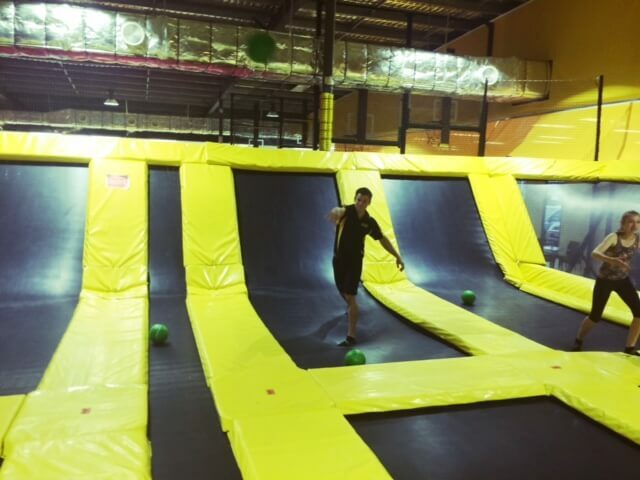 The 5 D’s of Traditional Dodgeball…Dodge, Dip, Duck, Dive and Dodge has been replaced by the five A’s of Indoor Trampoline Dodgeball: Air, Adrenaline, Aim, Avoid, and Air. Once you’ve played on the Big Boing Indoor Trampoline Arena you will be hooked. junior 11 – 13 years, 14 – 16 years teenage teams. Teams consist of 6 players. For a school term length competition. 1. Each game begins 6 players or an even amount of players and an even amount of balls. 2. No headshots, you will be called out. 3. Players are out if you are hit with a live ball below the shoulders or if you throw a live ball that is caught by an opponent. 4. Once out, you may not re-enter until the next game begins. 5. No sitting or lying on mats. 6. You may deflect a ball being thrown at you by using a ball in your hands. 8. No holding a ball for longer than 10 seconds. 9. Avoid collision with other jumpers. 10. No rough play of any kind. 11. No climbing the trampoline walls. To join our competition, call the Big Boing 5493 6015 or email enquiries@thebigboing.com.au.